Indian Motorcycle Adventures is a New Zealand company with 20 years continuous experience of operating fully guided tours in India on classic Royal Enfield Bullets. Join your hosts and owner operators Steve, Lily and Kamal whose extensive knowledge and contacts will give you the motorcycling and cultural experience of a lifetime. In our 18 day October tour of ancient Rajasthan, we take in its romantic palaces, forts, temples and wildlife reserves at a relaxed pace, travelling mostly on country roads. Our July and August Himalayan rides from Shimla to Leh via the rarely travelled Spitti Valley cross some of the highest passes in the world in an 18 day tour. All of our tours take you straight to the heart of Indian life and will leave you with indelible memories. Why pick Indian Motorcycle Adventures? 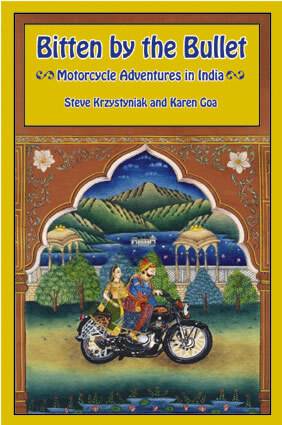 An entertaining illustrated account of our adventures motorcycling in Rajasthan, co-authored by Steve and travel writer Karen Goa.